The origins of today’s great Suzuki empire began in 1909 with power looms for cotton weaving. Motorcycles were added in 1952, and car production began in 1956. In 1970, a 369cc 2-stroke engine was installed in the front of a small utility vehicle–the Jimny. With 4-wheel drive and the appearance of a mini-jeep, the Jimny was a new departure for Suzuki, but a very significant one as its descendants are probably better known than the early cars. They found an important niche when they were introduced into the European market in 1979 as a small and reasonably priced 4x4 vehicle. Suzuki did not enter the U.S. market until the mid 1980s. 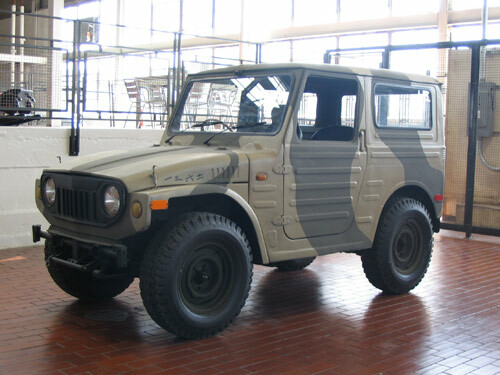 Although this vehicle was painted as such, the Jimny was not used for military purposes.